Adventures in Sparkland: Halloween etc. First, a photo by request. DarcKnyt wanted to see the infinity scarf arm-knitted for me by my sister, so here it is. 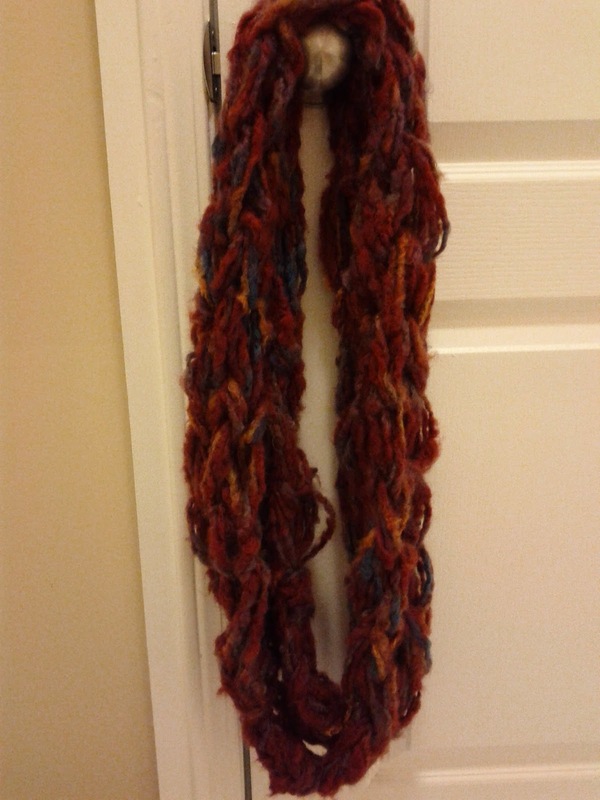 I like it so much I have assigned it a permanent place hanging from this doorknob, so that I can appreciate its warm colours and cozy texture every day. Third, me in a panda suit. This was an impulse buy. As I was in a streetcar, rolling along downtown, en route to meet a friend, I spotted some amazing onesies in the window of an Ardene. I was so taken by them that I made a point of going back after my coffee date. 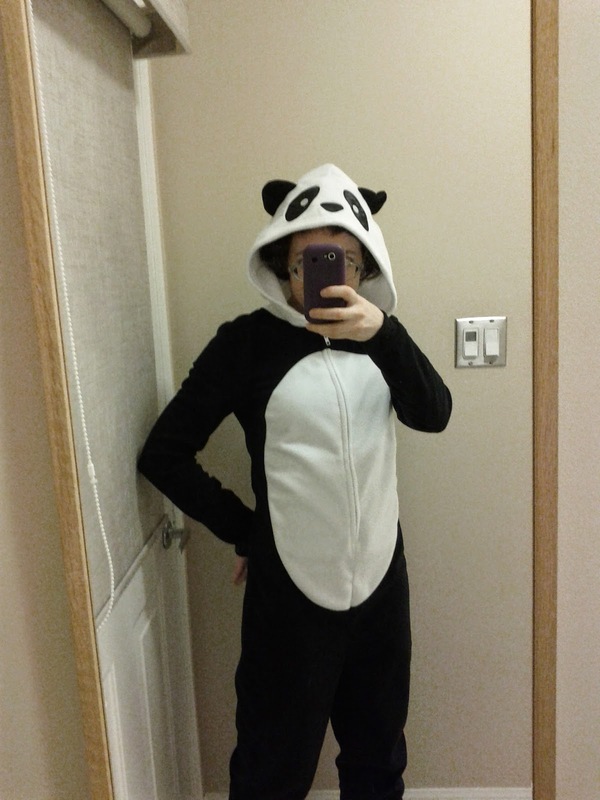 Selection was limited (the elephant suit, complete with trunk, was no longer available in my size) but I was completely satisfied with this panda option. I wore it while handing out candy to the neighbourhood kids, although it hardly seemed to register with them. They were too busy trying to peer into my candy bowl to see what goodies they were about to score. However, I did get some appreciation from the accompanying adults. The fleece onesie is so comfortable; I can totally see myself lounging around the house in it on cold winter weekends. It was so warm that I would only flip the hood up when answering the door. If my furnace ever fails on a very cold day, this is what the furnace repair technician will find me wearing. Aw, thank you Spark! I love the scarf! It looks great! And so does that pumpkin! ...which, technically I suppose, is a Jack O'Lantern. You did a terrific job with that. You may have won yourself a job you might not want year to year. ;) Still, with that sort of quality, you've EARNED the bragging rights. Kudos on your mad skillz. And the panda suit looks amazing on you! I would look more like Po from Kung Fu Panda if I could find a onesie in my size, but you flatter the design. VERY cool! The panda onesie is amazing! Good find. Awesome Pandaness... I challenge you to wear it 24/7 for the next month!!! You deserve a pat on the back. 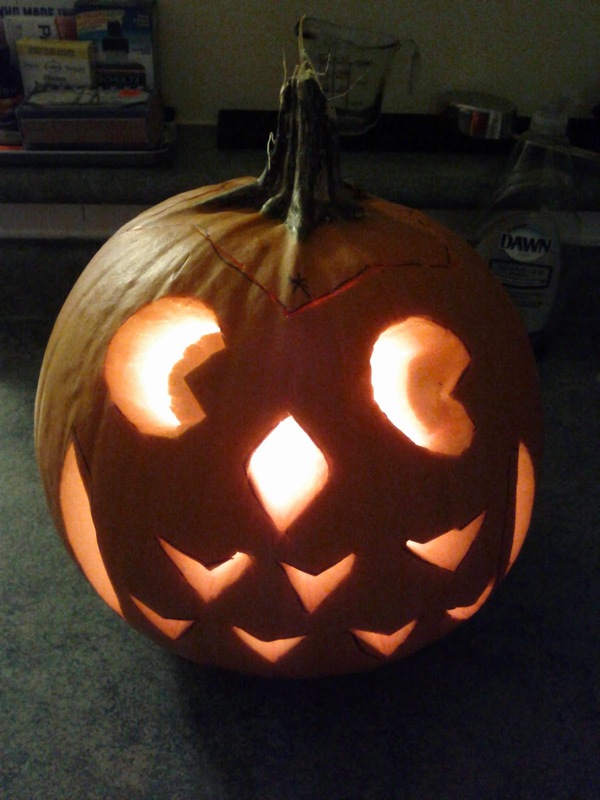 I have only tried to carve pumpkins a few times all disastrous. I want a Panda suit!!!! You look very cute in that panda outfit. And I can relate - suffering from cold feet at night sometimes. That would take care of it, I think. Love your carving! Good job. Still more talents you possess, Spark, your pumpkin looks great! Almost as good as you in a panda suit! Seriously, cool, and I'm glad it keeps your toes warm.